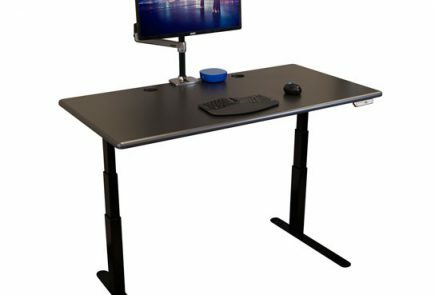 An exclusive private-label desk offered only through a single ergonomics products retailer, Fully, the Jarvis is built on a commodity base frame made by Jiecang of China (see our separate lab test review of the Jiecang base). A minor modification of a heavier foot distinguishes it slightly from direct competitor UpLift Desk. Fully offers many choices for its desktops, including very cheap Chinese-made options and very pricey American-made alternatives. However, all tops are sold without warranty coverage of any kind. But the standalone Jarvis base gets high review marks on Amazon from DIYers who use their own tabletops. Compares favorably against other Chinese-sourced bases like Uplift, S2S and Conset. 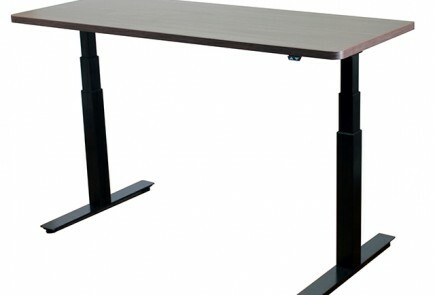 But for slightly more you can get an American-made base if not an entirely made-in-America desk from makers like iMovR. 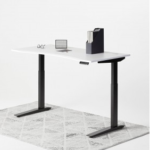 Configured with a 3-segment leg ("extended range") and 30"x60" laminated desktop with dual grommet holes and digital controller the Jarvis prices out as $630. Cheaper entry-level and much pricier versions with exotic hardwood tops are also available. 7 Years on frame, electronics, and moving parts. no warranty on desktop. Electric, offered in both 2-segment and 3-segment versions. Offered in both 2-leg and 3-leg versions, as well as a crank version. The Jarvis is a very popular middling option in electric standing desks. The 7-year warranty on the base frame is competitive with UpLift's, which uses the same Jiecang, Chinese-made componentry. Many American-made top options are offered alongside the cheaper Chinese-made options like bamboo, though very pricey. Heavier feet distinguish it from the UpLift 900 standing desk, lowering the center of gravity of the desk and thus providing marginally better stability. The Chinese-made base frame (Jiecang) and top options are of cheap quality and have significant performance issues. The "industry leading" warranty is anything but, and doesn't cover desktops - not even the $1200 vanity tops. Environmental claims about the bamboo tops are egregiously misleading, as are many of Fully's marketing claims. Equal-quality Chinese-made desks can be had for less, and for only a little more one could upgrade to a much higher-quality American-made desk. No leg extension options for taller users or treadmill desk users. 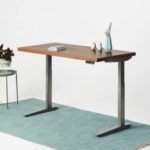 The Jarvis is a mid-tier electric, stand up desk sold exclusively by Portland, Oregon-based ergonomic products retailer Fully (formerly known as ErgoDepot). 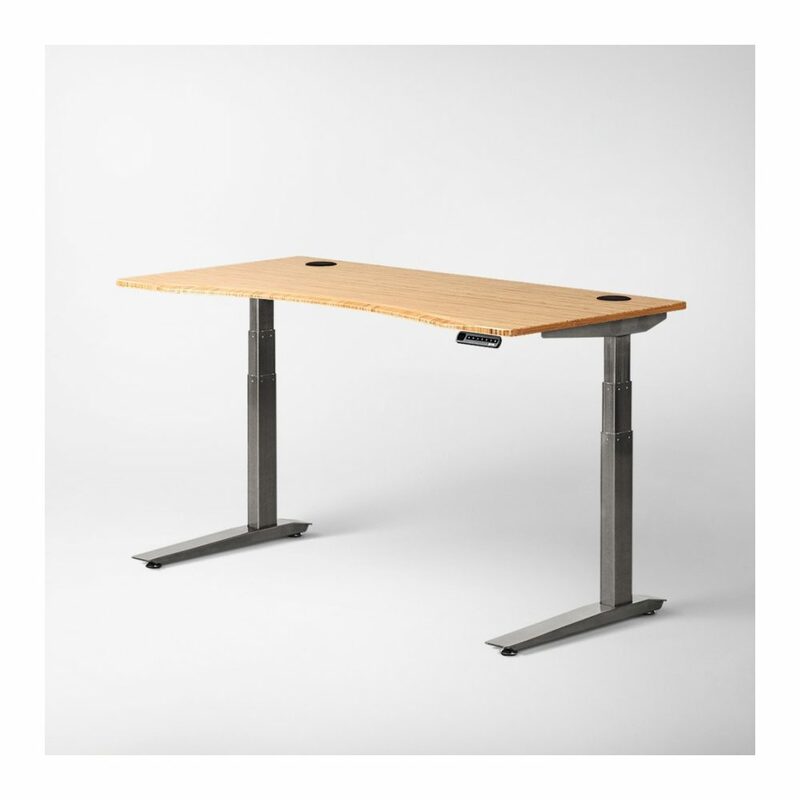 As such it is not a product sold by any other dealers; it is essentially an exclusive private label product created by Fully, replacing any and all third-party desk products that they used to sell. The Jarvis is no doubt one of the most popular selling standing desks on the market, being both competitively priced and sleekly marketed. In this review we see how it stacks up to the competition—namely the UpLift Desk from Human Solution—and how Fully’s marketing claims pan out. If you’re considering either of these nearly-identical desks, we’d also suggest checking out their nearest competitor, also made-in-China but with a lower price and better warranty, the StandDesk Pro. The most important part of any standing desk is the mechanism and electronics that make it a height-adjustable apparatus. At its core the Jarvis is built on a commodity standing desk base made by Jiecang of China. See our comprehensive lab review of the Jiecang Standing Desk Frame for a much more detailed review of this base. Many standing desk sellers use the Jiecang base as their platform. It is very cheap in container quantities, and the company has been around for quite a long time mostly selling to online ergonomic retailers who, like ErgoDepot, want to private label their own exclusive desk line. Each of these resellers pairs the Jiecang base with a different set of desktop options to create their desk system offerings. Most of the base frame parts are the off-the-shelf but Jiecang does require its resellers to pay for custom foot molds and to change graphics on the hand controller, since these are the two things the consumer would most readily be able to distinguish from a photograph. The Jarvis and UpLift use the same Chinese Jiecang base, with minor cosmetic differences like the graphics on the hand controller. The Jarvis is a mid-field option, with cheaper alternatives like the IKEA Bekant, Autonomous SmartDesk and StandDesk Pro at the low end, and premium American-made desks like the iMovR Energize, Cascade and Lander, or the Humanscale Float Table on the higher end. 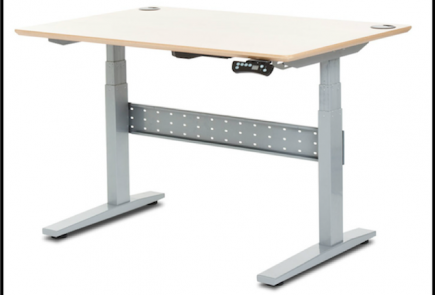 Its head-to-head competitor, however, is the UpLift Standing Desk from TheHumanSolution. Both also sell their standing desk frames standalone on Amazon for the DIY standing desk builder ($449, UpLift, Jarvis). So is there a real mechanical difference between the two sellers’ bases? Yes, and it’s all in the difference in the design of the lowly feet. As we detailed in our lab testing of the UpLift Standing Desk Frame, TheHumanSolution made the lightest aluminum feet we’ve ever seen on a standing desk, decreasing the entire desk’s stability for the sake of cost reduction and shipping weight (i.e. cost) reduction. Fully claims that their heavier feet lower the center of gravity of the desk and make it more stable. The base frames of the Jarvis and the UpLift standing desks are essentially the same Jiecang unit. Since both makers offer a wide array of desktop sizes and materials, it’s very difficult to do a side-by-side comparison. However, from a pure physics standpoint, the Jarvis’ heavier feet definitely lower the center of gravity of the desk, so would be the go-to choice between them if you’re thinking of a very large desk, like 72″ or wider. There is only the slightest cosmetic difference between the Jarvis’ and UpLift’s digital hand controller; both have the same cheap plastic feel and the same four programmable height presets. Both are the same electronically, including the cumbersome error code resets we discuss in the Jiecang base lab test. Both have an unfortunate characteristic of leaving greasy lines along the lengths of the inside tubs of the actuator legs, which is a common problem with Chinese bases in general. 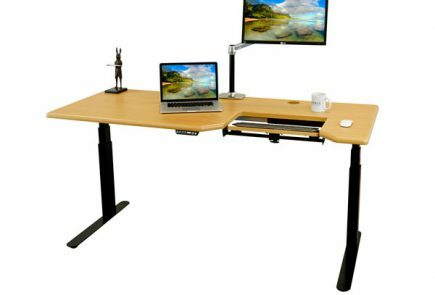 To learn more about the differences between Chinese versus American-made standing desks, see our detailed Comparison Review of Made-in-USA Standing Desks. To learn more about what factors into the stability rating of a standing desk read our in-depth article on Why Some Standing Desks Shake More Than Others. Like their arch rival UpLiftDesk, Fully offers a plethora of desktop options. So many that we had to write a primer for consumers to understand all the desktop materials lingo… be sure to check out our Ultimate Guide to Desktop Materials for Standing Desks if some of the buzzwords coming up aren’t familiar to you. Also like UpLift, Fully is very big on promoting their bamboo desktops as the best choice for someone who is environmentally conscious. These bamboo tops are the cheapest thing you can put on a Jiecang base other than a powder-coated top (literally spray painted MDF), which sells for the same price. There’s a reason bamboo tops from China are this cheap, and it’s not because bamboo is a fast-growing crop (as both Fully and UpLift claim). The facts around the environmental scourge that has been created by the mass farming of bamboo grass and converting it into a wood product are in shocking contrast to marketers’ claims. The urban myth surrounding bamboo’s environmental goodness continue to spread as these online marketers parrot each others’ claims despite a preponderance of scientific evidence to the contrary. As you can read in our comprehensive report of Bamboo Standing Desks – Separating Fact from Fiction, if you care about the environment, this is the very worst selection you can make for a desktop. 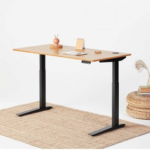 Fully also repeats this offense in the marketing for their Cooper Standing Desk Converter, also offered in bamboo. The other option in the same price range, the power-coated MDF, is also a false bargain. Powder coating is literally the simplest and cheapest way to take a plank of MDF and make it look pretty, but use harsh cleaning chemicals or spill Coke on it too many times and the paint can literally dissolve away. We don’t recommend it due to its low durability, though it is inexpensive. For $25 more you can upgrade to a traditional HPL (high pressure laminate) desktop. This is the classic lamination on top and bottom, with edge banding on all four edges. While definitely more durable than powder-coat, there are still open seams for air and moisture to get into and degrade over time, and a place for bacteria to gather. Edge banding eventually strips away, and the sharp corners and edges aren’t as nice as ergo-contoured edges like on the bamboo top. For most people HPL is a familiar and acceptable option. Fully offers it in six colors and anywhere between two and six sizes, depending on the color. For $75 more than laminate you can upgrade to a whiteboard laminate. The idea is cool until the first time you get marker on the sleeve of your shirt, and then it’s not so cool, but if you like to doodle right on your desktop this is a great concept. Fully was offering reclaimed hardwoods in four finish tones for about $650 more but we’ve learned that these tops were having challenges with cracking and warping, which is a common problem with reclaimed wood desktops. At the time of this update Fully appears to have at least temporarily discontinued offering reclaimed wood tops although we expect they’ll try a different supplier soon enough. 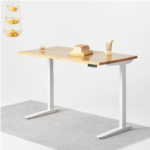 In their head-to-head competition with UpLiftDesk the lack of a reclaimed wood option may be as visible as a missing front tooth. For a little bit more you can get a real maple desktop in one of five finishes made by RocketMission. It gets even more hoity toity than that. For $1200 more than the price of the standalone base you can buy the Oregon White Oak tabletop made by The Joinery right there in Fully’s back yard. We have to say it’s a little odd to see someone spend this kind of money to put a hardwood top on a cheap Chinese base, but it is definitely one of the nicer options Fully offers. As real wood tops go Fully’s are are domestically-produced but not nearly to the same level of craftsmanship and finish quality as those offered by competitors. While cheaper than some of the other competitors’ domestic solid wood offerings you do get what you pay for in terms of durability, finish quality and overall value. For a deeper dive on this subject be sure to check out our comprehensive round-up Comparing real wood desktop offerings from Fully, UpLift and iMovR. While there are seemingly many desktop options here they are not offered in the broadest array of sizes and colors. When compared to the more premium iMovR desks (the closest to the Jarvis would be the Energize or the pre-assembled Lander) with much more durable Surf(x) 3D laminate, ergo-contoured edging, and literally thousands of color and size combinations, the price of a complete desk with a quality top is fairly comparable. And if real wood is really your thing, definitely check out the 36 species/stain combinations iMovR offers on its all American-made Lander desk line. As the assembly process is predominantly a matter of putting the many parts of the base frame together, please see our review of the Jiecang Standing Desk Frame for details. All in all the process is fairly standard for a base that is shipped as an “IKEA kit” of parts for the user to put together. Those who do not enjoy the DIY experience might consider hiring a professional installer, or just going with a pre-assembled standing desk. With all the concerns our expert reviewers raised above about the quality of the Jiecang base, the good news is that Fully has extended their warranty for a full 7 years, which they call “industry leading.” It is equal to their competitor UpLift’s 7-year warranty but not as long as the 10-year warranty that our sister company iMovR gives on all their electric standing desks, all of which are made in America. But the real problem with both Fully’s and UpLift’s warranty coverage is that the desktops are not included. Where a company like iMovR’s will offer their 3D-laminated desktops with a 5-year warranty, Fully and UpLift offer none. The durability of their bamboo, powder coated and HPL laminated tops leave a lot to be desired and this is reflected in the fact that they will not warranty them against delamination or other common problems with these lower-quality surfaces. Issues with their reclaimed wood tops were so prevalent as to cause Fully to (at least temporarily) suspend their sale. So like their environmental claims, claims of stability and strength performance of their bases, their claims of offering an “industry leading warranty” are misleading. The Jarvis is a middling offering among the many choices of electronic standing desks on the market. 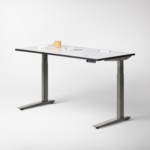 With a finely honed marketing sheen and heavy advertising campaigns, it has become one of the most popular desks sold today. Its pricing, while competitive on the surface, is higher than other Chinese-made alternatives, and not so much cheaper than better-constructed, made-in-USA alternatives as to be truly competitive. While you can at least opt for American-made vanity tops to pair with your Jarvis base these are much pricier than the desk itself. While we have concerns about the Jarvis’ performance claim and lack of warranty on the desktop, we can say that Fully provides exceptional customer service, and when problems arise they will take care of replacing components quickly. If you’re considering a Chinese-made standing desk because of budget limitations, it’s worth paying a little more for the customer service versus something like the Autonomous or Bekant. Also see our review of the Jarvis Standing L-Desk. Independently verified Jarvis Standing Desk user reviews can be found on Amazon. The Jarvis desk is garbage. I recently purchased a 72″ and it shipped broken – the right leg just buzzes. It took 3 days to get connected to warranty support who determined that the leg was fine but that the control module was broken. A week later, the new control module arrived and the desk is still broken with the identical symptoms as before. After a 20 minute wait on hold after refusing to hang up and let them call me back, they’ve determined that I need a new desk leg and will ship me one… next week. I’ve had a broken Jarvis desk sitting in my living room for 3 weeks. I’d really recommend staying away from this desk. I’d contacted the company in hopes of getting one of their desks and they were nothing but unhelpful. Overall waste of time and negative experience. As an alternative I got a standing desk at Costco that sells for almost $200 less and comes with a 5 year warranty. My friend has the Jarvis and we both like my desk much more. Go to costco and save yourself $200 while getting much better support and help. 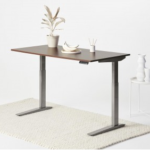 Costco has churned through a number of different standing desk vendors in recent years… do you happen to know what make/model of desk you purchased, and whether Costco is still selling it? I’m sure some of our readers would really like to know. I absolutely LOVE my 72″ Jarvis desk with bamboo top. I’m at it 9 hrs + per day. My floor is thick carpet. While it does move a little when I am moving around, it doesn’t bounce or jiggle as I would have expected when fully raised. I was considering a jarvis desk but one of the things I worry about is wobble. At my conventional desk now it’s very solid. I can sort of push off the desk to adjust myself in my chair if I’m lounging backward. How’s the stability at the normal desk height, does it wobble if pushed? Thanks. My co-worker bought a Geek desk so I had that to compare against. I decided to buy my own “geek” desk so I did my research before I decided on one. I ended up buying the Jarvis 72″ desk with Oak top and black frame. I also got the programmable controls so i could set my favorite standing and sitting positions. I purchased two grommet holes in the back and the swivel pencil tray for underneath. The instructions could have been a little clearer with better graphics, but I assembled it first time without a hitch. I LOVE this desk. The table top is solid as a rock. The fit and form are great and the movement is smooth. The swivel pencil tray is plastic and at first impression, appeared to be cheap. However, it is very handy and holds what I need. I would get the tray again if I purchased another desk. The shipment comes in two deliveries from two locations but they both arrived within one day. All in all, I got a better desk than the Geek desk and it ended up being over $100 cheaper.